Step 1: Preheat the oven to 350 degrees F. Line a 9×13″ baking pan with parchment paper. Step 2: Make Crust: In a large bowl, whisk together flour, brown sugar, cinnamon, and salt. Add butter and use your hands, or a pastry cutter, to cut the butter into the flour mixture until it is crumbly and moist. Press into prepared pan and set aside. Step 3: Make Filling: In a large bowl, beat cream cheese and 3/4 cup sugar until light and fluffy. Add eggs, one at a time, beating well between each addition. Mix in vanilla and salt. Pour over the crust. Step 4: In a small bowl, toss together apples, 2 tablespoons sugar and cinnamon. Set aside. Step 5: Make Streusel Topping: In a medium bowl, whisk together brown sugar, sugar, flour, and oats, then cut in butter with a fork or pastry cutter. Step 6: Scatter apples on top of the cheesecake mixture, then top with oat mixture. Step 7: Bake until the cheesecake is only slightly jiggly in the center, about 55 minutes. Let cool completely, then refrigerate for at least 2 hours. 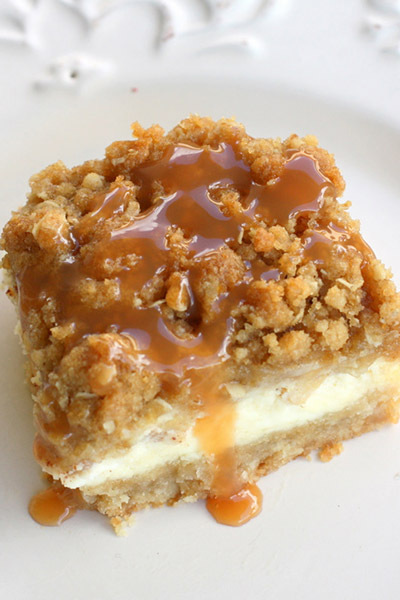 Step 8: Before serving, drizzle with caramel sauce and slice into squares. Enjoy this wonderful dessert recipe from Delish!